His “airness” will represent the U.S. in the 2010 Air Guitar World Championship in Oulu, Finland on August 27. Ricardo Reyes, who works full-time as a busboy at Barney’s Beanery, showed the big boys who got skillz in Pop-A-Shot. Unsuspecting NBA All-Star players were pitted against Ricardo. Let’s see how they fared. After embarrassing them all, Ricardo came away with a Red 2011 Ford Mustang! Congratulations, Ricardo! Conan O’Brien, who took over as the new host of The Tonight Show in June 1, 2009, upgrades his old bit of predicting the future from his former show in Late Night. Here’s the first installment. How Can You Lose With A Name Like Hot Lixx Hulahan? Craig Bilmeier a.k.a. 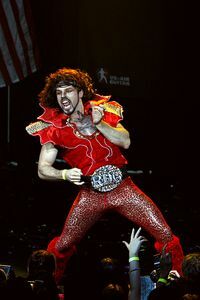 Hott Lixx Hulahan was crowned the winner of the 2008 Air Guitar World Championships in Oulu, Finland on August 22. He beat 19 other contenders from around the world. He was praised for his “impeccable timing and an overall solid performance that took the audience by storm.” He dethroned two-year reigning air guitar champ Ochi ‘Dainoji’ Yosuke from Japan. So why do pet owners leave them pooh?!? Them dogs do not know better. Where’s the responsibility? Don’t even try to blame them dogs. How hard is it to pick up them pooh when poop bags are already provided? I feel bad for the neighboring (human) community situated right next to the park. Park rules are posted at the entrance and designated locations within the park. It’s amazing the town has to still remind irresponsible people of the rules and public health. While Captain Doo may get their attention, maybe it’s better to “Pick up the pooh or lose Fido!” Woof!